PetHangout is bringing out the preppy in your pup with our Classic Plaid Dog Coat With Leash from our Cool Dog Jackets collection. There is an ultra plush fur collar which tops off the look. 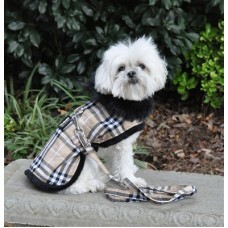 Your pup will be walking in style with this coat! PetHangout carries more amazing coats like our Red Harness Coat and a Popout Hood Coat.